The demand on land to supply healthy water, food, beverages, textiles, energy, and recreation continues to rise. As demand continues to rise for land and all that it provides the value of prime land continues to increase. The most sought after properties with competitive advantage of water, productivity, logistics, and location are in highest demand. As these prime properties achieve higher values the next tier of properties gain interest from investors. As farmers and business professionals we understand the growing demand placed on agricultural properties to provide clean and healthy products to the community and the world. Land is not like other investments in that it is fixed and finite. We specialize in land, vineyards, and luxury estates. 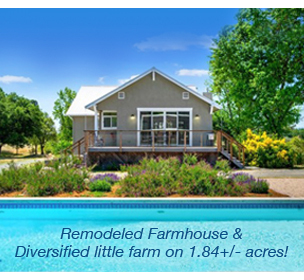 Our experience encompasses residential, multi-unit , commercial, pasture land, vineyards, wineries, mining, equestrian, dairy, and agriculture conservation easement properties.